Last year, the number one New Year’s resolution in America was to lose weight! But why wait until the new year to make health a priority? 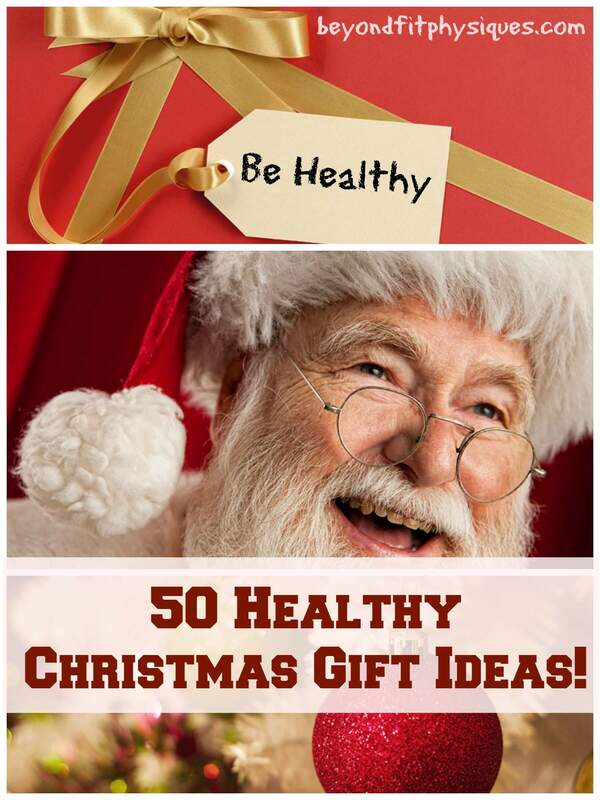 To help you get started, I’ve put together a list of some of my favorites gift ideas that support a healthy lifestyle and make great gifts for the holidays. Hi, I’m Kate… and I’m a lulu addict.From super comfy scuba hoodies to some of the CUTEST tanks on the planet, but my FAVORITE lulu product are their yoga pants. My sweet husband doesn’t understand how I can spend “this much” on workout clothes, but I have to tell you- they lastforever, they wash up well, and they’re the most comfortable gym clothes I’ve ever owned. I’ve tried just about every blender out there, and the Vitamix is by far my favorite. I use it daily- sometimes several times per day! It’s awesome for super thick protein shakes (blends the spinach so well you won’t even notice it) as well as soups, sauces and even homemade nut butter! Food Processors save so much time! Why would you chop everything individually when you can get the job done- literally in just seconds?!! From veggies to nuts, just place everything in the food processor, press the button and BAM! Everything is ready to go. Some of my favorite things to prepare in a food processor include: nut butters, salsa, sauces, soups, and to finely chop my vegetables. 4) Healthy Recipes Book- I love to ask women what their biggest at loss struggles are. Not surprisingly, the #1 and #2 most received responses for what is challenging for women when it comes to fat loss is “No time” and “Diet food tastes bland.” Promote healthy eating by giving a fun (and healthy) recipe book! There are tons of healthy recipe books out there, so you’re sure to find something to please everyone on your list. If you’re not sure where to start, I recently took some of our favorite quick & easy recipes and put them in an ebook for my clients, and we wanted the opportunity to offer our ENTIRE BeyondFit family the ebook as well, so check out this awesome sale on our 15 Favorite Recipes EBook! The one down side to the vitamix is how make time it takes to clean. Plus it’s a little big and bulky. Soooo… for something smaller, I do love my magic bullet. I love the magic bullet for quickly mixing up homemade baby food, or for doing a quick chop job on veggies, etc. 6) Gym Boss Interval Timer- This is by far the BeyondFit coaches most used fitness tool. High intensity interval training is all the rage right now, and for fat loss, it simply can’t be beat. We love using interval timers because it gets you out of just counting reps and helps you focus on pushing hard and getting the most out of your workout. With an interval timer you can program the number of sets, rest period, intervals and overall workout time. All of our coaches use a Gym Boss Interval Timer– not just for Bikini Boot Camp workouts, but for our own personal workouts as well! Egg Whites are a staple in my diet. Rather than deal with separating the egg yolks (great treat for Gilby) from my egg whites, this egg separator is a simple tool that does the trick. Plus, it’s super cute and makes me laugh. I love my egg separator and use it all the time! What fitness enthusiast doesn’t also love coffee?! I am a huge fan of creating fat loss friendly versions of traditional treats, and one of my favorite healthy swaps is starbucks! Find some fun flavored coffee and send a healthy coffee gift basket or a simple gift card with a note to try BeyondFit’s Homemade Pumpkin Spice Latte… Ingredients: 1/2 cup Pure Pumpkin 1 cup unsweetened almond milk 1 tsp cinnamon 1 tsp pumpkin pie spice 1 tsp vanilla extract 3 cups coffee, brewed *Stevia (or your favorite sweetener) to taste… trust me, they WON’T be disappointed! Their tastebuds and waistline will thank you! You know how much I love protein pancakes… but another breakfast favorite of mine are protein WAFFLES! Same batter, just a fun twist on the usual. I simply pour my Protein Pancake batter into my waffle maker and make a perfectly healthy waffle. Changing the texture and adding variety to your menu helps keep things fun and exciting. If you want to learn the basics of hormonal fat loss training & nutrition in a way that’s both easy to understand and easy to implement, check out my 101 Post-Natal Fitness Tips! It’s a great starting point- for moms of all ages- and for hormonal fat loss enthusiasts everywhere! And Amazon.com now offers the Kindle edition- SWEET! 🙂 If you’re interested in growing your faith as well as improving your fitness, check out our Momsanity Mission: 30 Days of Devotions & Workouts for Moms as well! Along the same lines as the waffle maker, the mini pancake pan makes healthy breakfasts a breeze! This is great for protein pancakes (the batter can sometimes be a bit runny) and it makes perfectly sized portions for Jackson! If you haven’t checked out our fit Friday holiday pancake series yet, make sure you check out the AWESOME protein pancake recipes!! From red velvet cake and beyond… you don’t want to miss it! Ok, so I saw the Hot cocoa snowman idea on Pinterest and thought it (with a few little tweaks) would make an adorable gift for fat loss lifestylers everywhere. Here are the switches I’d make before putting this snowman cutie under the tree: Unsweetened Cocoa Powder + Stevia in the Raw (yep- totally looks like snow) = super cute, fat loss friendly, homemade holiday gift! I’m a huge salad lover- I eat a salad almost daily! What I don’t love, though is drying each individual piece of lettuce. The salad spinner is awesome because it saves dry time. Rather than patting my chopped lettuce dry, simply place it in the spinner, give it a spin and it removes all the excess water from the leaves. A must have for those salad lovers out there! One of my favorite fitness accessories is my “Gym Gem.” I actually got it as a gift a few Christmases ago and don’t think I’ve taken it off much since then. I have the 45lb weight plate toggle necklace, and as a super sweet Christmas gift least year, one of the women I coach gave me sterling dumbbell to my collection as well! When it comes to living the fat loss lifestyle, finding a quality, clean protein is a must! There are plenty of options out there, but one of our personal favorites is About Time Whey. With lots of delicious flavors (hello birthday cake & cinnamon swirl) and no chalky aftertaste, you can’t go wrong. No artificial ingredients… Just a clean, natural whey protein supplement, and personally, I love that it’s sweetened with stevia. We love ours mixed with water, unsweetened almond milk, in oat bran, and more! An exercise ball – doubles as a great “chair” for anyone at a computer a lot. P.S. Another super quick & easy fitness gift option…. a BeyondFit Gift Certificate! Give to a friend or to yourself- here’s a simple way to give the gift of health this holiday season! After purchasing, your BeyondFit Gift Certificate can be emailed to your recipient on the date of your choice, or you can print it to give in person during your special celebration. And here’s the great news: you don’t have to be local! And don’t forget about our BEYONDFITLIFE HOLIDAY DISCOUNT!! !